Today we're participating in the Give Cancer the Paw Blog Hop to help share news and information about cancer in pets. We've heard lots of great things about the Morris Animal Foundation and so when they contacted us about the Golden Retriever Lifetime Study, we were already familiar with it and happy to share the information. This is a guest post by Katie F. on behalf of Morris Animal Foundation. Visit morrisanimalfoundation.org/ to learn more about the animal health research that Morris Animal Foundation participates in. Doesn't that dog look cute? This Golden Retriever needs your help, though! Cancer is the cause of death for over half of all Golden Retrievers and is a major cause of death for other types of dogs, too. Morris Animal Foundation wants to put a stop to cancer in dogs, so this nonprofit has launched the Golden Retriever Lifetime Study. This study will look at how to prevent and treat cancer in dogs so that fewer canines will have to suffer. The study will focus on Golden Retrievers, but the results from this research will hopefully be able to help all dogs. Join us in the fight against cancer by signing up your dog for the Golden Retriever Lifetime Study or by simply spreading the word about this research project. We appreciate anything that you can do! Golden Retriever owners must be over 18 years old and reside in the contiguous United States in order to participate. Golden Retrievers must be healthy and less than two years old. Golden Retrievers also must have a three-generation pedigree. 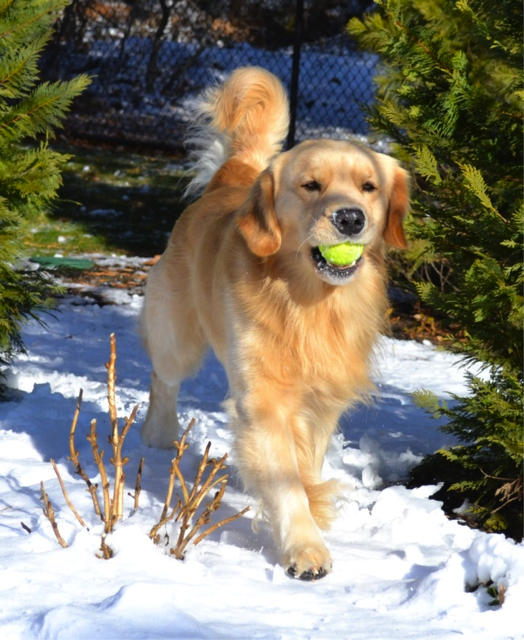 The main part of the Golden Retriever Lifetime Study will focus on questionnaires and annual exams. For more information about this study, visit the Golden Retriever Lifetime Study. We're joining the Give Cancer the Paw Blog Hop, co-hosted by Peggy's Pet Place and Pooches Smooches. In the first Give Cancer the Paw Blog Hop, we shared some information that we found helpful from our first-hand experience with canine cancer. Check out the blogs in the linky below for more great information. I think this study is so important and will help so many dogs in the long run. Thanks for helping bring awareness to it. And thanks for joining the hop!! Love the work they are doing - thanks for educating folks about it. Thank you for sharing this study. The Morris project is so important! Thanks for calling attention to it today! This is such a great study and I love that it is being shared on many blogs. I hope they get lots of puppies signed up for it, and maybe eventually those awful statistics for goldens can be changed. We lost one of our goldens at only age 8, and it's so hard not to worry about our other one, especially since she is a litter mate and at least two others from that litter have also died from cancer.